Post-democracy is a type where huge numbers of citizens simply have given up. And they have given up because they don't think politics or elections matter in their lives, they have made a decision, conscious or unconscious, that political/electoral participation is a waste of time, and that withdrawing makes more rational sense, despite its obvious perils. They have chosen to toss their political fate to the winds, keeping their fingers crossed that whatever emerges, or whatever faction is in control, won't screw them over. Post-democracy is a political iceberg of staggering proportions, and we're heading straight for it. So says Steven Hill in his new book, Fixing Elections: The Failure of America's Winner-Take-All Politics (Routledge Press, 2002). 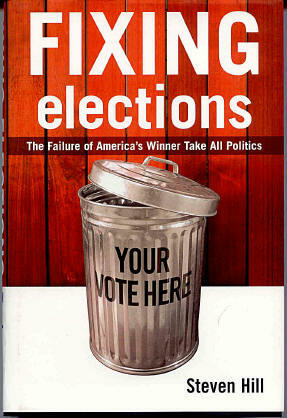 Fixing Elections is the most important book on American democracy that has come out in many years. Our antiquated electoral rules restrict the range of choices in politics, polarize the nation, and frustrate the growing number of citizens who do not vote at all. In Fixing Elections, Steven Hill explains why American democracy is broken – and how it can be repaired. It has been said that democracy is the worst form of government-except all those other forms that have been tried from time to time. The numbers would be comical if they weren't so alarming: only five percent voter turnout in the last Dallas mayoral election. Six percent in Charlotte, seven and a half percent in San Antonio. Seven percent in Austin.1 Seven percent in Tennessee's congressional primaries, six percent for a statewide gubernatorial primary in Kentucky,2 three percent for a U.S. Senate primary in Texas, and three percent for a statewide runoff in North Carolina.3 Several cities and towns in southeastern Massachusetts reported single-digit turnouts, with Rochester at seven percent;4 their 2000 state primary election drew less than 10 percent, a modern record low according to the Massachusetts Secretary of State.5 Outside Detroit, turnout for several school board elections was in single digits, one as low as 1.1 percent of registered voters; in Ann Arbor, an area that has a reputation for emphasizing education, turnout for school board elections has been well under six percent for the past several years, with one election sinking as low as 4.4 percent of eligible voters.6 In Virginia, the 1997 primary for attorney general, the state's top law enforcement official overseeing criminal as well as civil matters for the entire state, turned out five percent of registered voters, the lowest figure since 1949.7 For the first time, we have been seeing an increase in single-digit voter turnout levels all across the nation. Rational choice theorists should instantly recognize the sanity of their reasons: for most people, voting doesn't matter anymore. The act of voting on the first Tuesday in November seems increasingly pointless and-particularly in the middle of a busy workday-a waste of precious time.16 The "voting incentive" in recent years has seriously eroded, producing what Anthony Downs once called a "rationality crisis. "17 Washington D.C. has emerged as a kind of House of Horrors theme park, with much of what passes for politics today having degenerated into an obnoxiously partisan brew of bickering, spin, hype, petty scandal, name-calling, blaming, money-chasing and pandering. Politics today certainly puts to the test that famous Churchill witticism, that democracy is the worst form of government - except for all the rest. Americans, now the least exuberant participants in the established democratic world, have become used to diminished expectations. But in addition to our severe under-participation-which amounts to nothing less than a political depression-recent national episodes have pulled back the curtain to reveal that, besides being a politically depressed nation, we are a deeply divided nation as well. The impeachment debacle, the resignation of two House Speakers, lopped on top of Elian, O.J., Monica and various other deracinations now too numerous to list - and all of THAT capped by the astonishing UnElection 2000 - have each in their national moment exposed crisscrossed fault lines and fissures. Immediately following the November 2000 election, USA Today published a much-discussed map showing the counties all across the nation won by either George W. Bush or Al Gore. What the map revealed in its huge swaths of fiery red (Bush counties) and royal blue (Gore counties), was that the national divide has a certain shape to it: it is partisan, of course, but that partisanship has a strong regional element, as well as a cultural and racial component. This potent combination of national division - partisan, cultural, racial and regional - should raise the hairs on our necks. For whenever that combination has emerged in our history it has been explosive. Think of the Civil War in 1865; the aftermath of Reconstruction that produced Jim Crow and the "solid South;" the disenfranchisement and terrorizing of the freed slaves and their descendants; the violent struggles for civil rights 100 years later; and numerous conflicts in between and since. Our national division has emerged like that volcano that suddenly arose in the middle of a Mexican cornfield, its orogenesis completely unannounced and unexpected, growing larger and its shadow looming ominously over the surrounding landscape. Moreover, Census 2000 has revealed the galloping pace of our nation's diversity. Are our political institutions and practices ready for this? The 1990s began with the Rodney King riots that combusted South Central and other parts of Los Angeles; the decade ended and the new century began with a series of police shootings of unarmed black men in New York City, Washington D.C., Seattle, and elsewhere. In Cincinnati, a police shooting resulted in four days of the worst insurgency since the death of Martin Luther King. The 2000 presidential election displayed eye-opening levels of racially polarized voting, as did a statewide referendum in Mississippi in April 2001 that retained the use of Confederate symbols on their state flag.18 There are disturbing signs of national frisson on the horizon, and they seem loaded and ready to erupt if we don't deal with some of the precipitating factors. The central thesis of my examination is what is known as the Winner Take All voting system - Winner Take All for short. No, I'm not talking about voting machines, like the antiquated punch card voting machines known as Votomatics that burst upon the national scene during the UnElection 2000. I'm not talking about paper ballots or Internet voting, nor am I talking about the byzantine hodgepodge of voter registration or ballot access laws enacted in the fifty states. While those are all undeniably important, and part of the many components of our "democracy technology" that allows our republic to express and renew itself via periodic elections, I am talking about a type of democracy technology that is even more basic than those. Rather, I'm talking about the rules and practices that determine how the votes of millions of American voters get translated into who wins and who loses elections, resulting in who gets to sit at the legislative table and make policy. I am talking about the voting system itself, the engine of a democracy. Voting systems are to a democracy what the "operating system" is to a computer-voting systems are the software that make everything else possible. Like a computer's operating system, a voting system functions silently and largely invisibly in the background, and yet it has enormous impacts related to the five key components of a democratic republic: representation, participation, political discourse and campaigns, policy and national unity. What is a "voting system?" Popular reality TV shows like Survivor and The Weakest Link have been conspicuous in recent years in their use of elections. Remember when the Tribal Council voted for the final winner on Survivor II: the Australian Outback? The seven voters had to choose between the last two players, Tina and Colby; everyone had one vote and the highest vote-getter won. Well that was a type of voting system, and it even has a name - Winner Take All - because only one person - Tina or Colby - could win. The winner was going to get the million dollars, and the loser was going to get nothing (well, actually, the loser, Colby, got the consolation, $100,000). In fact, Survivor used the same selection method, i.e. voting system, each episode. For six weeks the highest vote-getter was voted off the show, whether that person had a majority of the votes or not. The Winner Take All voting system - highest vote-getter wins - and variations of it, as well as other voting systems that are quite different, are used in thousands of elections all over the United States. Yet most people take for granted the voting system used by their town, state or nation. It is invisible, just like a computer's operating system, we only notice it when it breaks down, when something goes awry like it did in Florida. But in fact there are different voting systems employed all over the United States, indeed all over the world. For instance, we use one kind of voting system to elect the president that gives a state's Electoral College votes to whichever candidate wins the most votes, even if that candidate has less than a popular majority - that's Winner Take All again, just like on Survivor, but with a lot more voters. And the machiavellian tactics used in our public elections aren't much different than on Survivor, either. We noticed the voting system during the UnElection 2000 because it broke down badly in various and unfortunate ways, well beyond malfunctioning voting machines, as we will see. Remember, Winner Take All is so named because the highest vote-getter wins everything, and all the other candidates win nothing. There was a lot at stake in the final official Florida vote for president, when George W. Bush won all of Florida's electoral votes even though he beat Al Gore-amid great controversy-by only a few hundred votes in the official count. Many Americans think that this "highest vote-getter wins" method is the only way to hold an election, because that method is so prevalent in the U.S., but it isn't. Survivor II, for instance, could have required that the person "elected" for rejection in each round have a majority of the vote, instead of simply the "highest number of votes." The fact that they didn't created problems on Episode 7, when two players tied, one of them being Colby, an eventual finalist. They resolved the tie by using votes in previous rounds as the tiebreaker, not a very elegant solution from a democratic point of view, since voters in previous rounds may have selected differently had they known the eventual stakes. Similarly, each state could require, for instance, that the winner of their state's Electoral College votes must have majority support, and use a two-round runoff (which is used in many southern states for state elections) or an "instant" runoff19 to arrive at that majority. Those would be two other types of voting systems, both of which get rid of the problem of spoilers and allows fields of multiple candidates to compete, raising issues and presenting electoral options to voters without fear of strange results like "split votes" and winners with less than a popular majority. Had we used a two-round runoff or instant runoff in the 2000 presidential election, we certainly would have avoided the five week Florida fiasco, and probably ended up with a different winner besides. That's because voting systems matter; different voting systems can produce different results, and some primitive voting systems produce distorted results. As this book will demonstrate, our antiquated Winner Take All voting system is at the root of much of what is perplexing and polarizing about our politics today, not only in presidential elections but in legislative elections as well. As numerous pundits and commentators have observed, the level of national division and partisan warfare is reaching a destabilizing level that our nation has not seen for many years. And the "winner takes all" nature of our electoral contests exacerbates the stakes, and hence the division and conflict. Worse than antiquated, Winner Take All is downright dangerous, distorting national policy, robbing voters of representation, and pitting partisan voters as well as racial, ethnic and religious minorities against each other for a scarce commodity - political representation. Americans are used to thinking of unstable democracy occurring in places like India, Italy and Israel, where collapsing coalitions for parliamentary government can topple the government. But when a presidential candidate can win with less than a majority of votes, and fewer votes than his main opponent, raising eyebrows as well as shouts of illegitimacy; or when one man, one Senator, Jim Jeffords from Vermont, can switch from Republican to independent and foment "a coup of one," throwing control of the U.S. Senate to the opposition party;20 or when one political party, the Republicans, can win a minority of congressional votes nationwide yet still end up with a majority of seats, as happened in 2000, those are clues that something is woefully amiss with our own democratic structures. This book analyzes the extent that the 18th-century "democracy technology" known as the Winner Take All voting system is affecting the five defining dimensions of our democratic republic: representation, voter participation, campaigns and political discourse, policy and national unity. These five dimensions are like the sturdy poles of the great tent of the republic, of representative democracy,21 holding it aloft. Winner Take All relies near-exclusively on (1) geographic-based representation, and/or (2) a two-choice/two-party political duopoly. From those two defining characteristics of Winner Take All other dynamics and tensions are unleashed that impact the five dimensions, often with unintended and damaging results. This analysis finds that the impact of Winner Take All is considerable; that the impacts are sweeping and, as we will see, decidedly troubling. Winner Take All is robbing voters of viable choices in the voting booth, and is contributing to an entrenched decline in voter participation and engagement. As we will see, most voters have become bunkered down into "safe" one-party districts gerrymandered during a secretive redistricting process that guarantees reelection of incumbents. Winner Take All also is distorting representation of the majority as well as the minority, including millions of "orphaned" Democratic and Republican voters living in opposition legislative districts, as well as racial minorities, women, independents and third party supporters. Moreover, Winner Take All's geographic-based paradigm is exacerbating national tensions that are turning entire regions of the country into virtual wastelands for one political party or the other. It is producing "phantom representation" and "artificial majorities" where a minority of voters sometimes wins a majority of legislative seats and a disproportionate, exaggerated amount of political power. In short, as we will see, Winner Take All has produced a national legislature that does not look like "the people" they purport to represent, nor think like us, nor act as we wish they would. No, under the distortions of Winner Take All, the majority does not necessarily rule. Winner Take All also underlies an alarming debasement of campaigns and political discourse, which have grown increasingly harsh, negative and uninformative; it affects how political campaigns are conducted, as candidates and political consultants chase the infamous "swing voters," that small slice of fuzzy-headed and disengaged voters who determine the outcome of elections in a Winner Take All system. New campaigning technologies like polling and focus groups, it turns out, are malignantly suited to the Winner Take All system and its typical two-choice/two-party field, allowing the precise targeting of political spin and hack-attack sound bites to ever smaller slices of swing voters, while everybody else and the issues they care about are relegated to the political sidelines. The dynamics unleashed by Winner Take All also are affecting how much money is needed to run a viable campaign, how the media covers those campaigns, and how political ideas are debated and decided. In short, Winner Take All is making losers of us all. Even the apparent winners lose when our representative democracy is so sickly. This escalating combination of bitter national division combined with dispirited political depression is particularly perilous, because each are mutually reinforcing of the other. As most players (i.e., voters), abandon the field in frustration, the game is left to be played by increasingly partisan careerists and professionals, and by the most zealous activists who seize center stage, further polarizing politics and policy. And as politics become more polarized, negative and downright nasty, more and more people turn off and tune out. One cannot help but wonder: what will be the political destiny of a nation that, on the one hand has fewer and fewer voters and diminishing electoral engagement, but on the other hand is so rife with the heated passions of deep political division and acrimony, cleaved along the volatile lines of partisanship, regionalism, and racial and cultural polarization? It's a confounding and alarming paradox. Much like stagflation has bedeviled economists with the twin scourges of inflation and recession-theoretically impossible, the textbooks once informed us - our national politics are being squeezed between the Scylla and Charybdis of a passionless political depression intertwined with the torrid fervor of partisan obsession and divide. And our 18th-century Winner Take All system is at the heart of the problem. Despite the enormity of its impacts, the Winner Take All voting system has been mostly overlooked or ignored by various political commentators, scholars and reformers, much to the detriment of our national discussion and efforts at reform. Yet the gravity of the moment requires a new term to describe what is happening to the national consciousness: post-democracy. That is, a polarized, splintered nation, nominally democratic, but with fewer and fewer voters. A nation where many of our civil institutions are still vital and our individual rights reasonably well protected, but where elections fail to inspire or mobilize, or to bind us as a nation. What are we to make of this fractured, voterless, post-democracy? Its onset is an alarming development in our nation's political history. It is important to note that post-democracy will not be merely the latest stage of an old, familiar specimen; post-democracy is not the same as pre-democracy. In fact, it will have transmogrified into a new and unexpected phylum of political life, a new evolutionary form without precedent in human history. Post-democracy is a type where huge numbers of citizens simply have given up. And they have given up because they don't think politics or elections matter in their lives, they have made a decision, conscious or unconscious, that political/electoral participation is a waste of time, and that withdrawing makes more rational sense, despite its obvious perils. They have chosen to toss their political fate to the winds, keeping their fingers crossed that whatever emerges, or whatever faction is in control, won't screw them over. Post-democracy is a political iceberg of staggering proportions, and we're heading straight for it. Yet it is rarely talked about around American dinner tables, there is no presidential-sponsored national dialogue, there are no gavels pounding in Senate committee hearings or in august courtrooms. There are few opinion page rants or "60 Minutes" documentaries, attempting to galvanize public attention and mobilize the national brain trust, seeking a solution. Instead, all there is, is silence. A silence that is occasionally broken by a few well-meaning but misguided missives about the impact of private money in elections, or TV talking heads debating the passions of presidential ejaculatory stains on a dress - and now the vagaries of chad, Votomatics and butterfly ballots. All the while the iceberg drifts, relentlessly closer, and practically nobody is talking about it. It's downright spooky. 1 Voter turnout numbers for Dallas, San Antonio, Austin and Charlotte come from: the Web site of the Dallas County Elections, 1999 mayoral election results, www.dalcoelections.org/election99/index.html; from the Web site of the City of Austin, www.ci.austin.tx.us/election (though it appears both Dallas and Austin list registered voter turnout instead of eligible voter turnout, making their actual turnouts lower than their listed figures); from Richard Berke, "Incumbent Big City Mayors Are Sitting Pretty," New York Times, November 2, 1997; from an Associated Press story, May 2, 1999, and from Henry Flores, professor of political science at St. Mary's University in San Antonio, in a paper prepared for the 1999 American Political Science Association entitled "Are single-member districts more competitive than at-large elections?" 2 Patrick Crowley, "Voters may be scarce in N.Ky.," Cincinnati Enquirer, October 31, 1999. 3 Caleb Kleppner, "N.C. could avoid costly runoff elections," Raleigh News and Observer, May 10, 2000. 4 Standard-Times, "Rain, rain go away. Come again another day," September 18, 1996, www.s-t.com/daily/09-96/09-18-96/b07lo092.htm. 6 Amy Lee, Julio Ochoa and Lisa Woods, "County millages pass, Oakland, Macomb voters support area schools' upkeep," Detroit News, June 12, 2001. Voter turnout rates below ten percent are common in Michigan school elections. In June 1995, Jackson County's North Adams school district recorded one of the lowest turnouts in Michigan History, with only five of the fifteen hundred eligible voters casting a ballot on an 18-mill property tax increase. See Lori Yaklin, "Consolidate school elections with general elections," August 15, 1999, located on the Web at www.educationreport.org/article.asp?ID=2232. 7 Figures obtained from the Web site of the Virginia State Board of Elections, www.sbe.state.va.us. 8 Douglas P. Shuit, "Lack of interest cancels some local elections," Los Angeles Times, Sunday, February 21, 1999. 9 See "105.4 million voters cast ballots," Associated Press story written by John Heilprin, December 18, 2000. Voter turnout for the 2000 presidential election was 105,380,929 ballots cast, or 50.7 percent of those eligible, according to Curtis B. Gans, director of the Committee for the Study of the American Electorate. That figure was up slightly from 1996's 49 percent but was significantly lower than the 62.8 percent who voted in 1960, making the 2000 election among those with the lowest turnouts. Interestingly, among 16 battleground states where the race was hotly contested, turnout increased by an average of 3.4 percent compared with a 1.6 percent increase in other states. Ten states-Arizona, Hawaii, Idaho, Kansas, Louisiana, Montana, New Jersey, Oklahoma, South Dakota and Wyoming - none of them close - had lower turnout than in 1996. See Federal Elections Commission, "Voter registration and turnout - 1996," www.fec.gov/pages/96to.htm. 10 Fifty one million viewers watched the season finale of Survivor, according to Newsweek ("Reality TV's real survivor," Dec. 25, 2000, p. 77). Super Bowl 2000 was watched by more than 43 million households, according to USA Today, which translates into roughly 120-130 million viewers. Al Gore, the winner of the 2000 presidential popular vote, had 50.9 million votes, which was the most votes for any presidential candidate since Ronald Reagan. See USA Today editorial, "Why the NFL rules," Dec. 22, 2000. 11 The average voter turnout in House midterm elections from 1982-94 was 37 percent, and in presidential election years the House turnout was 48 percent - in both instances less than a majority of eligible voters. Statistical Abstract of the United States, 1998, pg. 297. The turnout has been declining in the past decade, with 1998's midterm congressional elections having a turnout of fewer than 33 percent of eligible voters. In that year motor voter laws boosted registration roles by 5.5 million to include 64 percent of eligible voters, the highest since 1970. Yet still voter turnout declined to its lowest level since 1942, as 115 million Americans who were eligible to vote chose not to do so. Source: Center for Voting and Democracy, Dubious Democracy 2000, report published on the Web at www.fairvote.org/2001/usa.htm. Also see The Political Standard, "1998 turnout hits 36 percent, lowest since World War II," newsletter of the Alliance for Better Campaigns, www.bettercampaigns.org. 12 David Cay Johnston, "Voting, America's not keen on. Coffee is another matter," New York Times, November 10, 1996, p. E2. According to Johnston, an estimated 95 million people watched O.J. Simpson take his freeway ride and 92.8 million cast ballots in the 1996 general elections. 13 "Voter turnout for 1945 to 1997: a global report on political participation," published and distributed by the Institute for Democracy and Electoral Assistance, 1997, www.idea.int. "Created in 1995 by 14 countries, International IDEA promotes and advances sustainable democracy and improves and consolidates electoral processes world-wide." 14 Youth voter turnout figures are from Curtis Gans of the Committee for the Study of the American Electorate. Voter turnout of 18-19 year olds in the 1994 midterm elections was 14.5 percent, which means voter turnout among this demographic dropped an astounding 41 percent between 1994 and 1998. Voter News Service estimated that 38.6 percent of 18-29 year olds made it to the polls in the 2000 election (see Wendy Sandoz, "GenY voter turnout increased, experts say," Medill News Service, Wednesday, November 8, 2000). Typically, youth voter turnout drops by about 50 percent between a presidential election year and a non-presidential (midterm) election year. According to a National Association of Secretaries of State study, youth electoral participation reveals a portrait of an increasingly disconnected and apathetic generation. Since the 1972 presidential election, when the voting age was lowered to 18, there has been almost a 20-percentage point decrease in voting among 18 to 24-year-olds, with only 32% going to the polls in 1996, a presidential election year (see their press release from their web site, "State secretaries push major youth voting initiative, New Millennium Project: why young people don't vote"). 15 One recent survey by UCLA's Higher Education Research Institute found a record-low interest in politics among new college freshmen in 2000, with 28.1 percent of respondents inclined to keep up with political affairs and 16.4 percent saying they discuss politics frequently. While that was only a slight decline from last year, nevertheless it was significant since "freshmen interest in politics traditionally increases during a presidential election year," instead of decreases, said survey director Linda Sax, a UCLA education professor. Historically, these results on political-engagement questions reflect a long steady decline, with highs in these two categories at 60.3 percent and 33.6 percent, reached in the late 1960s. Mary Beth Marklein, "Female freshmen doubt tech skills; college survey also shows record-low interest in politics," USA Today, January 22, 2001. A 1999 Field poll found that, in 1983 35 percent of young adults ages 18 to 29 said they followed civic events most of the time, but only 23 percent said they do so in 1999. That decline was exhibited also in ages 30 to 39, where interest in government and politics drop from 44 percent to 27 percent in the same period. See Associated Press story, "Californians (ho-hum) cool to politics (yawn)," published in San Francisco Examiner, April 30, 1999, p. A7. 16 By way of contrast, in certain European nations a less-than-majority turnout for national referendums automatically voids the election. Using that standard, virtually all American elections would be nullified. 17 Anthony Downs, Economic Theory of Democracy (Harper & Row: New York, 1957), p. 139. 18 Over two-thirds of Mississippi voters chose to retain the Confederate symbols on their state flag, in a racially-split vote. The civil-rights era still haunts southern memories. "As Mississippians voted to keep the Confederate cross on their flag, jury selection was under way in Alabama for the trial of a white man accused in the 1963 bombing of Birmingham's Sixteenth Street Baptist Church, which killed four black girls. Several civil-rights cases have recently been reopened, including some in Mississippi. But the Confederate flag remains the main lightning rod of controversy. Last year, the National Association for the Advancement of Colored People (NAACP) led an economic boycott of South Carolina, bringing the eventual removal of a Confederate flag from the statehouse dome. Three months ago, Georgia's legislators opted to shrink a Confederate symbol that had dominated that state's flag since 1956. Throughout Alabama, cities and counties have stopped flying the state's flag, which bears a strong resemblance to the Confederate banner. In most of these cases, pressure from white business to change was as great as that from black politicians. Indeed, Mississippi's vote can also be seen as a rearguard action in the battle between rural white traditionalists and the proponents of a New South." The Economist, "Not as simple as it looks," April 19, 2001. 19 Instant runoff voting (IRV) simulates a series of runoff elections to produce a majority winner in a single election. At the polls, people vote for their favorite candidate, but they also may indicate their second, "runoff" choice and subsequent choices, ranking them 1,2,3. If a candidate receives a majority of first choices, she wins. If not, the candidate with the fewest votes is eliminated, and the "instant runoff" begins. Each voter's ballot counts for their top-ranked candidate still in the race. The eliminated candidate is no longer a "spoiler" because the votes of that candidate's supporters go to their runoff choice. Rounds of counting continue until there is a majority winner. IRV is used to elect the President of Ireland, the mayor of London, the Australian national legislature and officers of various NGOs like the American Political Science Association. For more information about instant runoff voting see the Web site of the Center for Voting and Democracy, www.fairvote.org. 20 The "coup of one" comment came from a very sour outgoing Senate majority leader, Trent Lott. After losing the Senate leadership, Lott apparently agreed that something was broken about democracy in the Senate. In a final parting shot, an incendiary note that contradicted President Bush's call for a new bipartisan atmosphere, Sen. Lott wrote that Republicans must "wage war" because "we have a moral obligation to restore the integrity of our democracy, to restore by the democratic process what was changed in the shadows of the back rooms in Washington...We must ensure that the decision by Senator Jeffords is accurately portrayed, now and for history. It was a "coup of one" that subverted the will of the American votes who elected a Republican majority." Sen. Lott, who preferred to gloss over the untidy fact that Americans did not elect a Republican majority in the Senate - the Senate had been tied, 50-50, which is, after all, what allowed Senator Jeffords' resignation to overturn the Senate - then went on to confusedly assert that the Democrats should not now be treated as holding a majority. Democrats, he said, "hold a plurality, not majority in the Senate," and "their effective control of the Senate lacks the moral authority of a mandate from the voters." Despite Sen. Lott's confused tantrum, he had succinctly put his finger on a real problem - due to the Senate's bizarre internal rules, including the Winner Take All aspect of committee assignments, powers of committee chairs, dictatorship of a mere majority and more, a "coup of one" was made possible. Richard L. Berke, "Lott Takes Parting Shot on Eve of Senate Power Shift," New York Times, June 3, 2001. 21 I am using the term "representative democracy" as a more descriptive term of what some call a republic or republican government. A republic is actually a subset of the large genus of democracy, but unlike direct democracy exemplified by New England town meetings it is a form of democracy where public policy and decisions are made by democratically elected representatives. A republic or representative democracy is particularly more suited for larger populations and the mass society that we have become.